A soldier goes berserk in a barracks and shoots his two best friends and three other soldiers, terrifies another into taking a fatal leap, and then turns a pistol on himself. Two of the victims linger for a few days before succumbing to their injuries. In the end, the bloody toll is five dead, including the gunman, and two wounded. Though mass shootings have become all too common in 21st-century America, this one happened a century ago, in 1918, the final year of the first World War. 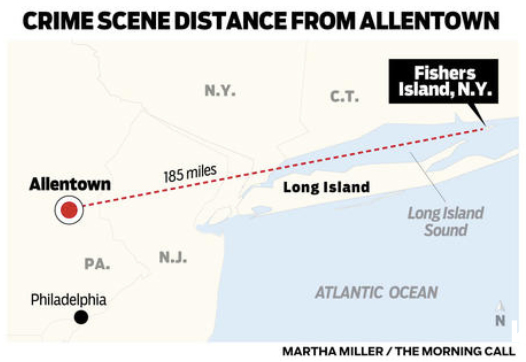 The killer was James J. Boyle of Allentown, a 36-year-old Army sergeant and combat veteran. He was in uniform for a dozen years, came home to work on a railroad, and re-enlisted promptly after the United States declared war on Germany in 1917. The scene of his crime was a fort off the coast of Connecticut, where he was preparing to go to France. Those who knew him were shocked by the horror he unleashed. An unmarried son of Irish immigrants, he had an easygoing manner and served his country honorably both stateside and overseas. “He was a strapping big fellow, of splendid appearance and genial personality,” The Morning Call gushed the day after the April 10 tragedy. Army investigators looking for a motive noted he had been feverish while home on leave just before the shootings and described him as “inclined to be morose, prone not to complain if ill.” They believed that either of two physical setbacks might have contributed to his insanity: an unspecified illness he suffered while fighting rebels in the Philippines, or a head injury from an Allentown rail-yard accident that left him unconscious for five days. Boyle’s hardscrabble path to mass murderer began in the Luzerne County mining village of Drifton, near Hazleton. He was born there in 1881, the year the Boyles came to America from Donegal, Ireland. While still a boy, he worked in the coal mines, as did his father. His mother stayed home to raise a brood that would eventually grow to eight, with James the fourth oldest. In 1898, two weeks after the Spanish-American War ended, Boyle enlisted in the Regular Army. He was just 16 years old. There is no question, it being established by the evidence, that he was insane at the time of the commission of the crimes in question. — Army report on Sgt. 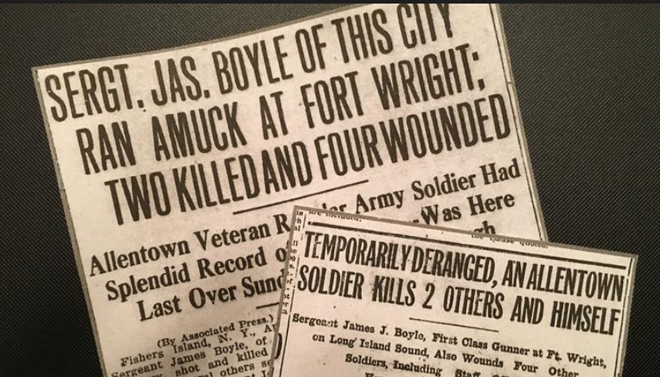 James J. Boyle rampage in April 1918 at Fort H.G. Wright on Fishers Island, N.Y.
His official military personnel file can’t be found. Papers in other files, such as one that tracks the benefits he received as a veteran, show he first served with the 6th Field Artillery Regiment at Fort Monroe, in Virginia. He was honorably discharged as a private in January 1899, but the Army suited him so well that he signed up again and again. At least one of those hitches took him to the Far East, where he experienced combat. Boyle saw action in 1903 against the Moros, a Muslim minority that fiercely opposed U.S. control of the southern Philippines, and earned “a reputation for bravery and discipline,” The Morning Call reported after speaking with his family and friends. He apparently served under an officer who would become an icon of American military leadership — John “Black Jack” Pershing. The 6th Field Artillery took part in an expedition against the Moros led by then-Capt. Pershing, the celebrated future commander of U.S. forces in Europe during World War I. Pershing conducted several campaigns in the fall of 1902 and the following spring in the Lake Lanao region of Mindanao Island. 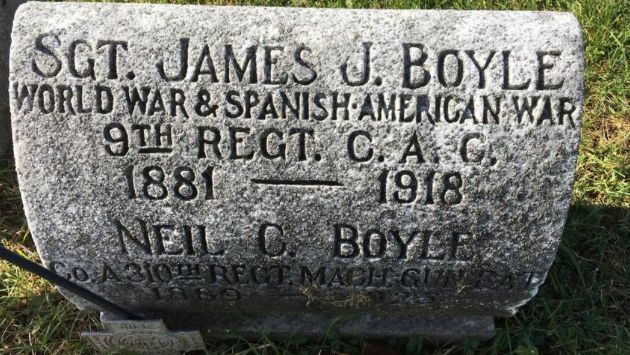 Boyle’s service during the Moro Rebellion qualified him as a Spanish-American War veteran. Sadly, he paid for it with his health, contracting the illness cited by investigators in his murder-suicide case. In 1911, after his fourth enlistment expired, he went to live with his family in Allentown. They moved to the city around the turn of the century, when it had about 35,000 residents, less than a third of its population today. At first, the Boyles rented a house on Ridge Avenue. Later they bought one on Gordon Street. The twin home still stands, just a stone’s throw from Front Street and the old Neuweiler Brewery. Boyle’s father, the onetime miner, toiled in a limestone quarry until he went blind. Boyle helped his family get by, paying his mother $10 a week for board. He had a job as a brakeman with the Central Railroad of New Jersey, working in the east Allentown classification yards, where tracks and switches sorted rail cars by destination. Members of the local labor union, Just-in-Time Lodge 346 of the Brotherhood of Railway Trainmen, welcomed him into their midst. The rail-yard accident that knocked him out and left him senseless for days happened in 1912. Details aren’t known, but the injury left a permanent scar on his forehead, which was noted in the murder-suicide inquiry. In the fall, he was transferred to Camp Meade, an infantry training site halfway between Baltimore and Washington. There, he wore sergeant’s stripes in the 311th Machine Gun Battalion. It must have felt like a throwback to his childhood, because the battalion was built around a core of men from Luzerne County. They would soon be among the first troops equipped with the new Browning machine gun. Boyle wasn’t with the 311th long enough to get his hands on one. Early in 1918, he was assigned to the decade-old Coast Artillery Corps. His new post was at Fort H.G. Wright, which stood on Fishers Island, which is 9 miles long, a mile wide and in Long Island Sound, 7 miles from New London, Conn.
During the war with Spain, big guns were moved to the fort to protect the sound’s harbors. Besides gun batteries, it had dozens of buildings, including a boathouse, a bakery and a blacksmith shop. 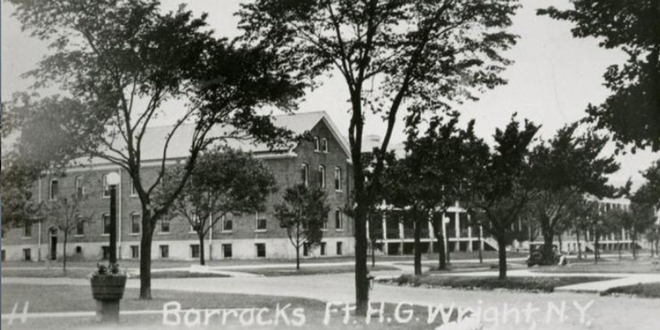 By the spring of 1918, Boyle had been on the rosters of two units at Fort Wright and had settled into another, the 9th Company. The Coast Artillery Corps was busy moving its companies into new regiments for duty in France. With a major German offensive underway, more U.S. troops were urgently needed to join the fight. Many would soon be on the front lines of another battle. A new, insidious enemy was emerging in America’s heartland — the Spanish flu. Troops at Fort Riley, Kan., fell ill with chills, fever and fatigue. In the fall, the virus would turn deadly on a mammoth scale. Ultimately, it would kill 675,000 Americans and tens of millions of people around the world. Boyle seems to have become one of its early victims. On Sunday, April 7, he went to Allentown on a short furlough to say goodbye to his family and friends. He told them he expected to ship out to France soon. But something was wrong. He wasn’t his hardy self. As he was leaving the city the next night, he complained about pain in his head. He said he feared he was coming down with the grippe, a bygone term for the flu, but that he knew a doctor at the fort who could fix him up. A worried brother-in-law accompanied him to New London, the jumping-off point for Fishers Island. On April 9, Boyle rejoined his company at the fort, feeling weak, perspiring freely, his face pale. In a “crazed state of mind,” Boyle went into the barracks of the 4th Company, a unit he previously belonged to, and walked into a squad room. From a holster hanging in a locker, he took a pistol belonging to a Sgt. Chadwell. He replaced its empty clip with a loaded one from Chadwell’s pouch. Boyle went to the company office and shot Sgts. Fred H. Cook and Adolph Hoitomt. They were his best friends. Cook, about 32 and from Abington, Mass., died instantly from a bullet through the heart. Hoitomt, 27, of Illinois, was hit in the jaw and survived. After wrestling with a Cpl. Cochran, Boyle took a pistol from a holster hanging in the office and loaded it. He went into the hall, where he probably met and killed Pvt. Tomacz Guzdek of Holyoke, Mass. Guzdek, about 30, was shot through the heart. It’s not clear where Boyle went next in search of victims: either to a squad room or to a back porch. Ernest M. Green of Brooklyn, N.Y., a private in 9th Company, jumped from the second-floor porch so he wouldn’t be shot. He hit his head on the steps below, fracturing his skull, and was unconscious until he died three days later. Newspapers mistakenly reported that Boyle shot Green in the head. In a lavatory in the barracks cellar, Boyle shot Pvt. Timothy Sullivan. Wounded in the thigh, Sullivan survived. Returning to the company office, Boyle loaded a pistol hanging on the wall. He went to one of the noncommissioned officers’ rooms on the second floor, locked himself inside and fatally shot himself. Ten soldiers rushed to the room, broke in the door and found Boyle dead. Incredibly, he had shot himself twice — in the left side of his chest and the right temple. “All wounds self-inflicted by use of .45-caliber Colt [semi-automatic] pistol,” a medical report noted, putting the time of his death around 11 a.m. It was his mother’s 67th birthday. In the afternoon, she and other family members were informed he had died but weren’t given details. Knowing he’d been sick, they assumed the cause was pneumonia. Later in the day, they learned the truth. Boyle’s remains arrived in Allentown on Friday, escorted by a Pvt. Harry R. Dodsworthy. They were brought to an undertaker and then to the Boyles’ brick twin on Gordon Street. The next day, Annie Boyle went to the Reliable Shoe Store on Ridge Avenue and, for $6.50, bought new Army shoes for her son to wear in his casket. Many came to the Boyle home to see him the following Monday. The funeral, The Morning Call wrote, “was one of the largest-attended ever witnessed in that section of the city.” A high Mass was celebrated in the Church of the Immaculate Conception at Ridge Avenue and Liberty Street. He was laid to rest in the churchyard, the English Catholic Cemetery. Soldiers from Camp Crane, the training site for military ambulance drivers at the Allentown Fairgrounds, fired a rifle salute over his grave. Railroad men from Just-in-Time Lodge 346 carried carnations, roses and daffodils. Back at Fort Wright, a board of four officers was convened to investigate the killings. There was some question whether Boyle “excessively imbibed in alcohol” just before he returned to duty, but the evidence and witnesses’ statements were contradictory. The officers felt he might have appeared drunk to those who knew him. The illness that hobbled Boyle appears to have been influenza. When he returned to Fort Wright, he was sweating profusely, feeling weak and complained of pain in his head.  He obviously had a fever, and the infection that caused it could have set him off, said Dr. Jeffrey Jahre, an infectious-disease expert at St. Luke’s University Health Network. “Almost anything from an infection standpoint can cause acute psychotic reaction,” Jahre said. Could the illness Boyle picked up 15 years earlier in the Philippines — such as dengue, malaria or yellow fever — have contributed to his condition? How about the concussion he received in the railroad accident? It’s possible, Jahre said, but there’s no way of absolutely knowing. “There’s always been this thought process that when people develop schizophrenia or severe psychotic illness, could that be related to an environmental or infectious trigger that happened long ago? That has been an area of controversy,” he said. Could he have erupted because of post-traumatic stress disorder, perhaps from his time in the Philippines? Not likely, Jahre said. “Remember that you’ve got a fever here. PTSD doesn’t present with fever,” he said. The medical record of Boyle’s suicide describes him as having blue eyes, gray hair and a ruddy complexion. He was 5 feet, 9 inches tall. No photo of him could be found for this story. Newspapers in Allentown and elsewhere didn’t run any with their articles about him. His records in St. Louis don’t include pictures. He had no wife or children to keep photographs of him for posterity. A great-niece reached for this story said she didn’t know about the incident. Overall, the America of 1918 was kind to Boyle’s memory. With the nation wholly committed to the war in Europe, his dark deed passed into the shadows. The U.S. doughboys won their first major victory, at the village of Cantigny in northern France, seven weeks after the gunfire at Fort Wright. In October, Sgt. Alvin York would perform heroically in the Argonne Forest, earning the Medal of Honor. And on Nov. 11, Americans greeted the armistice with euphoria. Boyle’s father, Neil, died the following spring at age 71. His mother continued to live on Gordon Street, supported by her children. With her soldier son gone, she got financial help from the government — $20 a month from the Veterans Bureau and $57.50 a month from a war-risk insurance policy Boyle had obtained, naming his mother as beneficiary. Annie Boyle collected these payments until she died in 1936, four days shy of her 85th birthday. Events leading up Sgt. James J. Boyle’s murder spree. 1881: James Boyle is born Oct. 12 in Hazle Township, Luzerne County. 1898: Enlists in the Regular Army two weeks after the Spanish American War ends, and serves in 6th Field Artillery Regiment at Fort Monroe, Va.
1899: Honorably discharged Jan. 25. 1903: Serves in the campaign against the Moros in the Philippines. 1911: Lives with parents on the 100 block of Gordon Street in Allentown after fourth enlistment ends. 1912: Works in the Jersey Central rail yards in east Allentown, where he suffers a head injury. 1917: Enlists in the active-duty Army on April 25; on Nov. 1 is made a sergeant in Company B, 311th Machine Gun Battalion. 1918: Becomes ill April 8 while home on leave; returns April 9 to his unit, 9th Company, Coast Artillery Corps, at Fort Wright, N.Y.; goes berserk in barracks April 10, killing three fellow soliders, wounding two others, terrifying another into taking a fatal leap, and ending his own life with two shots. David Venditta is a freelance writer.